Christmas For The Kids Osceola, Inc.
Christmas is a time for giving, sharing and joy. However for many families in our community, it is also a time of stress, depression and sadness when the holiday dream seems impossible. 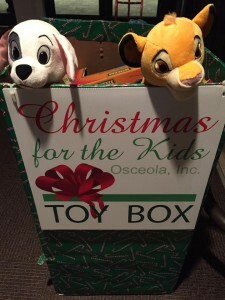 Christmas for the Kids Osceola (CFTKO), is a locally run non-profit organization made up of local businesses, governmental agencies, schools, community organizations and citizens who are committed to making those impossible dreams come true for children here in our county. Since 2009, this coalition of our community has served more than 14,000.00 families by providing gifts, food vouchers and hygiene products. This year we already have 2500 children registered. In order to meet our goal we need your help. Christmas for the Kids Osceola, Inc., reaches out to local families in need by providing a gift during the holiday season. We rely on the generosity of our community to help reach the goal of fulfilling the needs of families with children who otherwise wouldn’t be able to celebrate Christmas. Copyright 2018 - Christmas for the Kids Osceola, Inc.